Editor's Note: 4for4's DFS Subscription is now only $19! 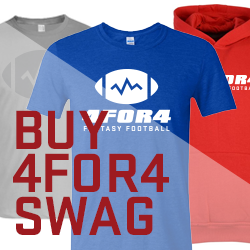 4for4 will be providing DFS subscribers with content throughout the entire NFL Playoffs, including Yahoo! content. First, the bad news: I didn't win any games on Wild Card weekend. None. Zero. Zilch. As in, one less than the amount of fake concussions Antonio Brown was accused of having last weekend. Now, some good news: I only played 3% of my money in play. The entire 3% was used to enter GPPs (nine entries into the $5 Rush) with a high-risk/high-reward contrarian strategy that didn't pay off. 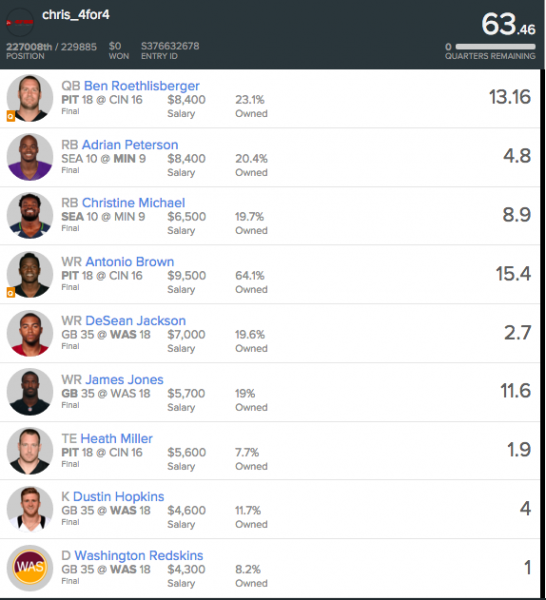 In a short slate, having the right combinations is crucial, and it turns out that I diversified way too much at kicker and defense and, my choices didn't pay off. The first choice that burned me was stacking Dustin Hopkins and the Redskins defense in quite a few lineups. Washington closed as a one-point favorite and the Packers had the lowest DEF aFPA, so I figured this was a low-cost contrarian choice that could pay off. It was certainly contrarian, and both plays hovered around 10% ownership, but it simply did not work out. Hopkins only managed one field goal attempt and missed an extra point, while the Redskins defense could not handle Aaron Rodgers for the game's last three quarters. The second defense/kicker combination that burned me was Nick Novak and the Texans. I had this stack in a few lineups, as I thought the game would be a defensive battle that could go either way, and the Texans would be cheaper and a lot lower owned than the Chiefs. As we all know by now, the Texans ended up getting romped 30-0, with Brian Hoyer (5 turnovers) consistently putting his defense in bad positions. Finally, I had DeSean Jackson in a decent amount of lineups. Unfortunately, Jackson casually failed to score this TD as if he was playing against himself in fantasy. For a change of pace and a laugh at my expense, I'll post my worst GPP lineup this week. *The ending balance slightly differs from the beginning balance plus net profit due to the deposit bonus being gradually released.